WASHINGTON, DC. 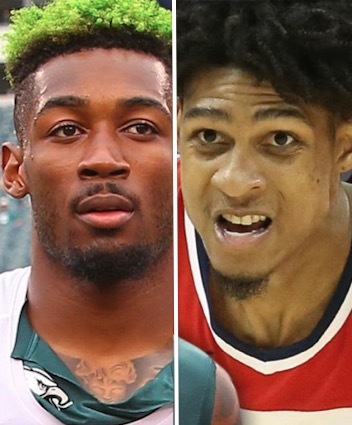 (THECOUNT) — Philadelphia Eagles cornerback Jalen Mills and Washington Wizards forward Devin Robinson were both arrested early Saturday morning outside of the Opera Ultra Lounge in D.C. and cited for disorderly affray. Two professional athletes were taken into custody this weekend after allegedly getting into an altercation outside the popular nightspot. Robinson was transported to an area hospital with unknown injuries. It’s unclear if either of the athletes actually made it to jail. According to a police report, obtained by the AP, Jalen and Devin were involved in a verbal altercation which escalated into a physical altercation on the sidewalk adjacent to Opera. No official word on what exactly led up to the alleged fight, but reports have come out suggesting Devin was pissed Jalen was in town … but didn’t play for a D.C. team, reports TMZSports. The Wizards released a statement saying they wouldn’t be extending Devin a contract for the 2019-20 season. He played seven games for the Wizards this year but mostly spent time playing in the G League. The Eagles are yet to issue a statement.